Designed primarily for use with CO2 for liquid withdrawal of delivery trucks, transports, stationary storage tanks, and in-line installations. Valves may be operated manually by cable or pneumatically. Intended primarily for CO2 filling and/or withdrawal on delivery trucks, transports, and stationary storage tanks with flanged pumps or piping. 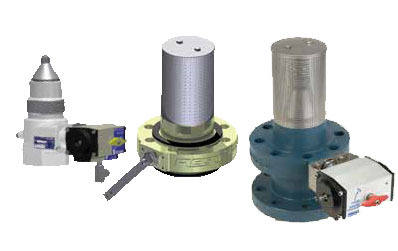 Valves are designed for quick and easy installation. Lever is available on the right or left side to allow for installation without the use of an extra pulley. Valves may be operated manually by cable or pneumatically. Valve, Internal, A3212C Series CO2 Threaded 2"
Valve, Internal, A3213C Series CO2 Threaded 3"
Valve, Internal, A3217 Series CO2 Single Flange 3"
Valve, Internal, A3217 Series CO2 Double Flange 3"